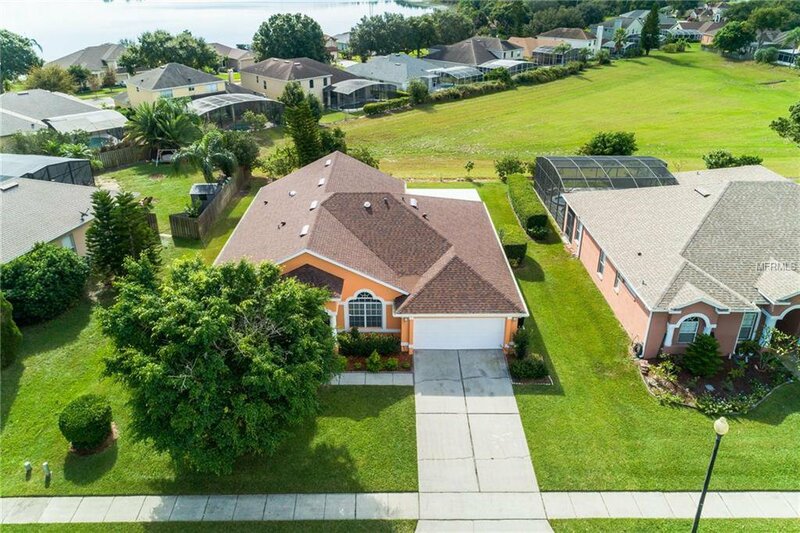 FANTASTIC DR. PHILLIPS LOCATION IN A MOST SOUGHT AFTER SCHOOL DISTRICT!!! This light and bright four bedroom, three bath home has a three way split bedroom plan and sits on a large lot with a sweeping view! The floor plan offers separate living and dining rooms- the living room could easily double as a dedicated office- plus an open concept kitchen and family room. The kitchen features granite counters, 42" cabinets, stainless appliances, a breakfast bar and a solar tube for added lighting. The family room opens to the extended, screened lanai and the large lot with big views. The private master suite has a large walk-in closet and bath with dual sink vanity, garden tub and walk-in shower. Plus there are three additional guest bedrooms and two guest baths. Additional home features and upgrades include: new roof March 2018; freshly painted exterior and new gutters August 2018; AC system replaced 2017; all sod replaced 2017; wood laminate flooring in all bedrooms plus living and dining rooms and wood flooring in the family room. All of this plus a great location with easy access to Dr. Phillips Park, Theme Parks, Restaurant Row, shopping, major highways, the airport and Downtown Orlando! Listing courtesy of WEICHERT REALTORS HALLMARK PROPERTIES. Selling Office: REGAL R.E. PROFESSIONALS LLC.